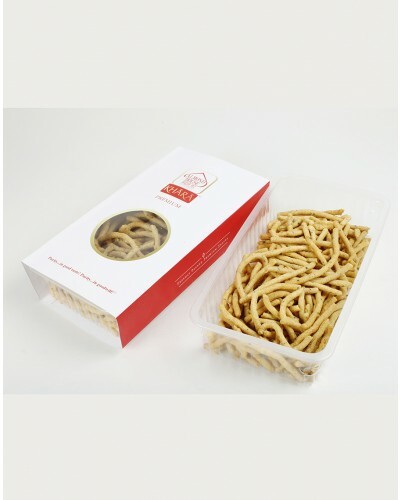 Tikha Ghatiya is a crunchy and spicy deep fried strand. It is made from gram flour and dough. It tastes best with salad and mango pickle. Tikka Ghatiya is a crunchy and spicy strands made from healthy ingredients. It tastes best with the deep fried chilies, carrot shreds, salads and mango pickle. It can be used as main ingredients in various types of chiwdas and mixtures and enjoyed on its own too available at Almond House Hyderabad Telangana.